Imagine seeing a small forest inside of a huge pot plant. Got it? Okay, now imagine that giant pot plant floating in the ocean? Got it? Excellent. Now, and this is the cool part, replace the pot plant with the visual of a ship. That’s what you’re going to see floating in the middle of the ocean in NSW’s Homebush Bay. 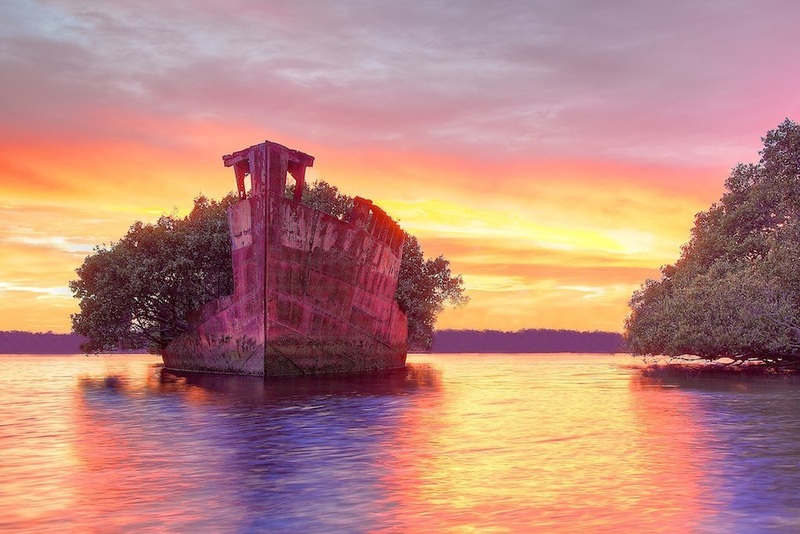 The shipwrecked SS Ayrfield has earned itself the nickname ‘The Floating Forest’ among locals and tourists alike thanks to the flora that’s spouted within the rusted, floating wreckage over the years. While you can’t access the ship, imagine a selfie with this bad boy. THINK OF THE LIKES, ADVENTURERS. THINK OF THE LIKES! Victoria was previously the site for the country’s largest gold rush, but these days the only gold you’re likely to find in ‘The Garden State’ is the absolutely golden view that you’ll find at the Pink Cliffs in Heathcote. The aforementioned gold rush gave birth to this site in regional Victoria, as it was heavy sluicing work that revealed these vivacious and vibrantly coloured hills to the world in the 1880’s. These partly man-made geological formations are comprised of mainly of fine clay and subsequently are fragile, depending on what part of the cliffs you’re traversing, but in spite of the mild risk one might choose to undertake it is without doubt a breathtaking spectacle and one we should keep in mind when thinking about your next tourist destination. This is a mining site and is often considered the opal capital of the world. What actually makes this place remarkably interesting though, is the fact that the whole town is underground! Seriously, here’s a photo of the inside one of the many underground hotels. This incredible town has been host to many film-makers and has appeared in several movies including ‘Fire In The Stone’ and ‘Pitch Black’. There are underground churches, underground hotels, underground book stores and while it isn’t underground, this town is also home to the world’s hottest golf course, with golfers bringing their own artificial patches of grass to accomodate their games. Here’s a photo of the golf course. Want to really go somewhere different? Yeah? Come here! For residents of the South East Queensland region Fraser Island may seem like an interesting choice for placement on a list titled ‘5 Places in Australia You Never Knew Existed’, but in actuality it is a must have on a list such as this. Fraser Island, located off the coast of Queensland, is the largest sand island in the world at 120 kilometres and within the island’s breadth is a number of interesting sites to see. For instance, one could start their morning traversing the Central Station Rainforest, spend one’s afternoon scuba diving/snorkelling in the numerous bodies of water such as Lake Makenzie, and end one’s day by taking a run along the Seventy Five Mile Beach. No matter where your interests lie Fraser Island undoubtedly has an activity for you. Bet you didn’t know there was a separate country within Australia? Well you do now. It’s called the Principality of Hutt River and was formed after seceding from Australia in 1970 over a conflict regarding wheat. No, i’m not joking. This country has its own currency, stamps, drivers license and visas, so when you visit, make sure you bring your passport!